The Toad Stool by Alan Wolk: Ellen's Selfie: Whose Win Is It? 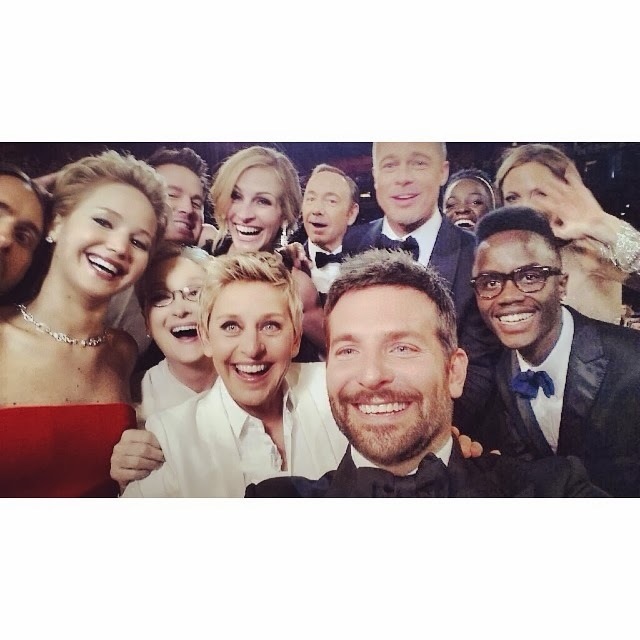 So Ellen’s Twitter selfie (taken by Bradley Cooper) has broken all sorts of retweet records and the usual suspects are claiming a win for Samsung. The brands that will garner a win from this are (in order) Twitter, the Oscars, Ellen, Bradley Cooper. Meryl Streep, Brad Pitt, Julia Roberts, Angelina Jolie, Jennifer Lawrence, and then, maybe, Samsung. So step one for the brand would be to get their PR people in gear and make sure they're attached to the moment. Is this a replicable moment that proves the overall viability of social TV? Not really. The confluence of a widely viewed live broadcast (e.g. no time zone issues) with celebrity presence and a Twitter-heavy audience makes it more of a one-trick pony that's a great example of the power of real time marketing and the speed at which something can go viral. Which is not to say it’s not a win for Samsung. It’s a great idea and far more powerful and buzzworthy than any of the TV spots on the show. But without the direct brand tie-in (and competition from Twitter and celebrity brands, it's not the win 1 million plus retweets would make it seem it is.